The Ismenian Dragon was one of the legendary beasts of Greek mythology, famously encountered by Cadmus, the Ismenian Dragon was the guard of a spring sacred to the god Ares. ​It was commonly said that the Ismenian Dragon was the son of the god Ares, although the manner by which it came into existence was not elaborated upon. The Ismenian Dragon would get its name from the place where it was to be found, for it resided in cave by the spring of Ismene in Boeotia; Ismene being the name of a Naiad nymph. 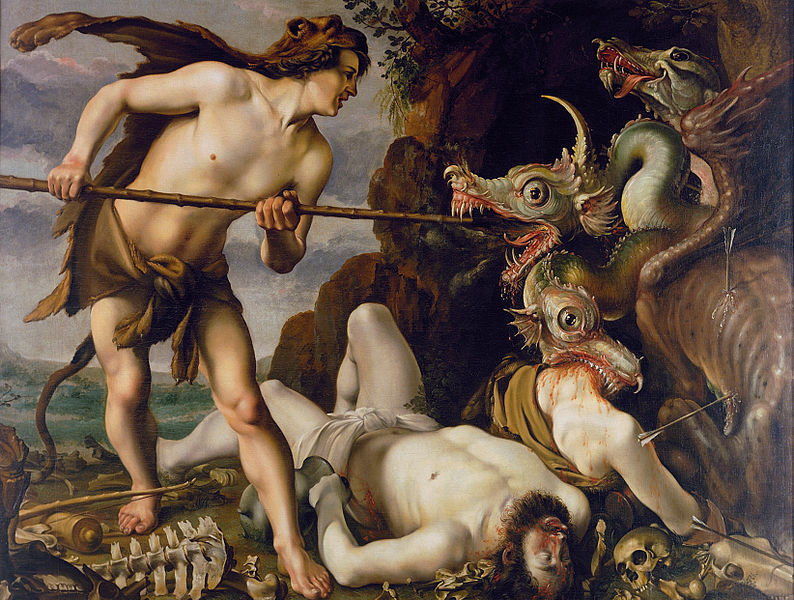 The Ismenian Dragon would guard the waters of the spring of Ismene, for it was considered sacred to Ares. ​It was to Boeotia that Cadmus followed a cow when advised to build a new city where that cow came to rest; and when the cow stopped Cadmus decided to sacrifice that animal to Athena and the other Olympian deities. Cadmus sent his men to fetch water from a spring they had passed, and so Cadmus’ men went, not knowing that the spring was sacred to Ares, nor that it was guarded. ​Thus it was, that as these men, dipped their pails into the spring, so the Ismenian Dragon emerged from its cave. ​Now, whilst the Ismenian Dragon was called a dragon, the term dragon was used often by the Ancient Greeks to refer to a serpent, particularly water snakes or constricting ones. 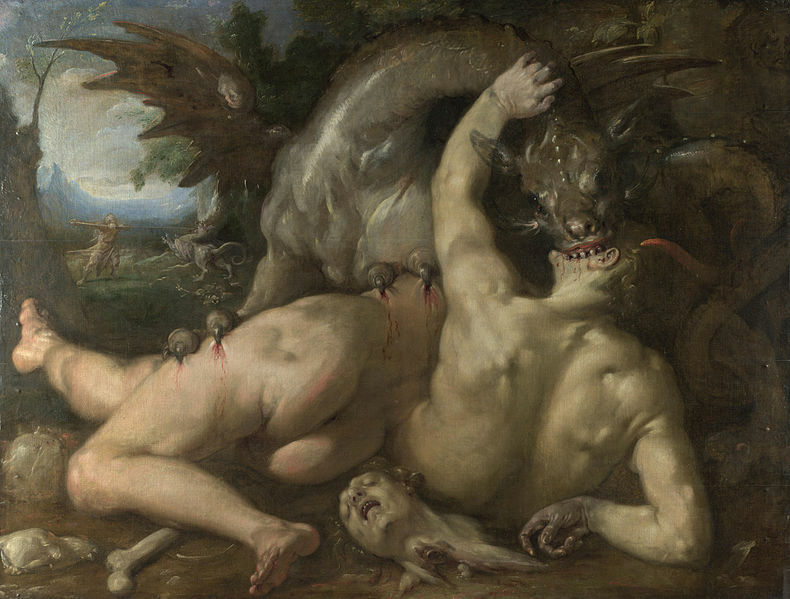 Ovid, in Metamorphoses, tells of the Ismenian Dragon being both a venomous and constricting snake, with three rows of teeth, and a three forked tongue. The Ismenian Dragon was of no normal size either, for when it uncoiled itself, it could stand so that its head exceed the height of the highest tree near to the spring of Ismene. Thus it was when the Ismenian Dragon emerged from its cave and saw men taking water from the spring, it attacked, killed every one of Cadmus’ men, and whilst some were struck by the fangs of the beast, and some were crushed to death by the Ismenian Dragon. When his men failed to return from fetching water, Cadmus set off to look for them. Cadmus would thus come upon the bodies of his men by the spring, and there also saw the Ismenian Dragon, thoughts of revenge for his fallen men overcame his fear of his beast, and Cadmus threw a massive boulder at the serpent. Some tell of how this thrown stone killed the Ismenian Dragon, but others tell of how Cadmus advanced after he had thrown the stone, skewering the Ismenian Dragon with his lance, until body of beast and a tree were conjoined. For killing the Ismenian Dragon, Cadmus would be punished, performing as a servant of Ares for a period of time, perhaps having been transformed into a snake to do so. ​It could be said that the Ismenian Dragon had offspring, of a sort, for Cadmus now distraught that he had no men to build his new city, was guided by Athena. 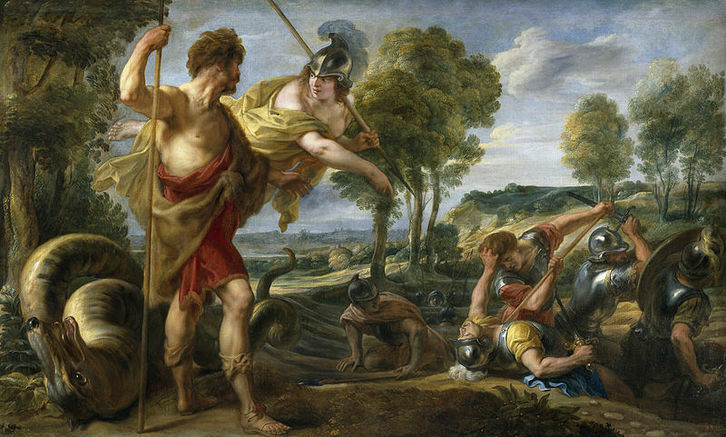 Athena advised Cadmus to plough the soil, and then to sow half of the teeth of the Ismenian Dragon. Once Cadmus did so, many armed men sprouted from the ground, the Spartoi, the sown men, children of the Ismenian Dragon and Gaia. ​The Spartoi would fight amongst themselves, until only five were left alive, and these five Spartoi would help Cadmus build his city, and the descendants of these men, and thus of the Ismenian Dragon, would make up the royal families of Thebes for countless generations.